I’m sure this recipe would work really well in a slow cooker. Put the vinegar in a bowl. Cut the meat into fairly large chunks, at least an inch square, and toss them in the vinegar. Slice the vegetables, except the potatoes, and cut up the tomatoes. Peel the large potatoes. Melt the dripping in a large, heavy casserole and add all the sliced vegetables, and the tomatoes. Saute for a few minutes, till they start to soften and release some juice, then sprinkle on the flour and cook for a few minutes more, stirring, till they are slightly coloured. 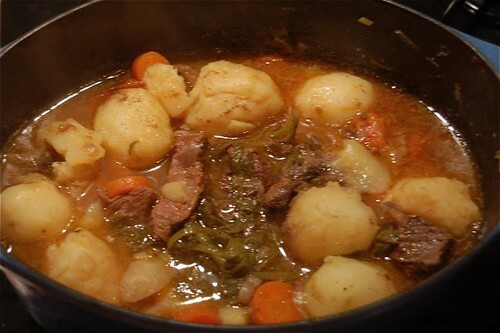 Add the meat, the peeled large potatoes, and the celery leaves, and season generously. Cover tightly and cook over a very low heat for 3-4 hours. An hour before it’s done, add the small potatoes, peeled but left whole, and put the lid back on. When the meat is really tender and the potatoes are cooked, taste and season further if necessary. It really doesn’t need anything else with it, although a green vegetable would be a good idea. Note: the original recipe instructs you to stir the soufflé over ice till almost set, before pouring it into the mould. I didn’t do this because I didn’t have any ice; I just put it in a sink of cold water. But I think if I’d used ice it probably wouldn’t have separated, because it would have cooled much faster and I wouldn’t have had to spend so much time stirring. So have some ice handy. Also, this all sounds more trouble than it is; it’s really quite quick to make (especially if you cheat and use bought caramel!). Use the sugar to make caramel in a dry pan. When it’s done, protect your hand from any splashes and pour in the 3 tbs water. Return to the heat and stir till smooth if it seizes. Set aside. Prepare 4 individual ramekins by tying strips of oiled greaseproof paper round them so that they protrude above the rim. Put the sheets of gelatine to soak in some cold water. For the soufflé base, put the eggs and yolks in a bowl with the sugar over a pan of barely simmering water. Using an electric whisk, beat constantly for about 10 minutes until the mixture is thick and frothy, and the whisk leaves a trail on the top. It won’t be hot, but should be warm. Remove from the heat and start adding the caramel, still whisking. Taste as you go, till it seems caramelly enough. Whisk in 1 tablespoon of whipped cream. Squeeze out the gelatine and add it to the hot water and lemon juice in a small bowl, stirring to dissolve (the egg mixture isn’t hot enough for this, which is why you have to do it separately). Then whisk it into the eggs. Put the bowl inside another bowl filled with ice, and stir until it is almost set. Then pour it into the moulds, using the paper to fill a bit above the edges, and put them in the fridge to finish setting. 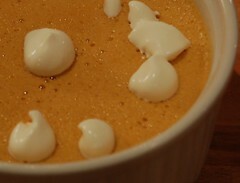 Carefully remove the oiled paper, and decorate the soufflés with the remaining whipped cream. You can use other flavourings instead of caramel – praline or coffee for example, or even pureed fruit. Be careful not to increase the amount of liquid added though, or it won’t set. What a great idea – the menu sounds very interesting. 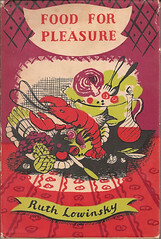 Have you seen the program by Valentine Warner called Ration Book Britain where he cooks old ministry of food recipes from WWII? It was on the digital channel ‘Yesterday’ last week but will probably be repeated again soon, they are also showing Wartime Kitchen and Garden with is also about cooking with rations, making do and supplimenting it with growing veg. Very interesting programs if you get the chance to watch them. I look forward to your next challange menu. I don’t get UK TV here, so I haven’t seen them. Shame, they sound interesting. I really do enjoy browsing through old cookbooks!